It’s been a while since I delivered a mixtape to you loyal readers. The first edition of the Workout mix debuted way back in early June with the second half due out mere weeks after, but despite having the mixtape prepped and ready to go for y’all, I’ve basically been a lazy writer. For those of your waiting to get your sweat on, hold out a few weeks longer, and your wish will be granted. 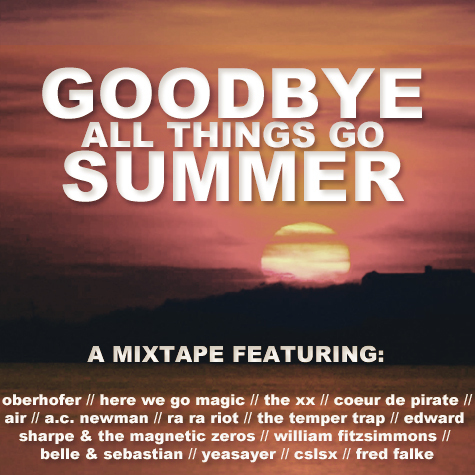 For those of you, however, looking to cling to that last little bit of Summer, look no further than the Goodbye Summer Mixtape. My 15 song opus features the usual suspects from the likes of Yeasayer, The Temper Trap, and Belle & Sebastian, but also features some newcomers (CSLSX, Oberhofer) and some dynamic remixes from relative unknowns like George Raquet and Big City Love Affair. As usual, the tracks are available individually and as a .zip file below. We like to make it easy for you. Cling on to that last little glimmer of Summer. The days get shorter from here on out. This entry was posted on Wednesday, September 8th, 2010 at 11:59 am and is filed under Zack. You can follow any responses to this entry through the RSS 2.0 feed. Both comments and pings are currently closed. Will dl when I get a real internet connection! Liked it all but “Home” made me feel real good, ridiculously good. All of the music files featured on this site are for sampling only. If you like any of the songs, please go buy the albums. If you are the owner of a music file or picture featured on this site and would like it removed, please contact us at allthingsgoblog@gmail.com and we will gladly remove them. We Could Be Up in th… on What Planet Are We On? Enter your email to get updates every time we post something new! Donate To All Things Go! Where Did CP Go to School?